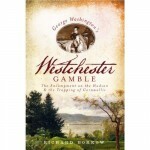 The following blog post was written by a special guest of the Westchester Library System, Dr. Richard Borkow. 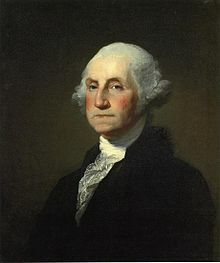 “The Westchester Library System blog is a fitting place, and Washington’s birthday a fitting time, to highlight a critical decision made by General George Washington in Westchester County in the summer of 1781, a decision that led to victory in the Revolutionary War. The decision was made in mid-August, 1781, during the 7th year of the war. That summer the allied American and French armies, under the command of Generals Washington and Rochambeau, were encamped side by side in lower Westchester. Washington deployed the American troops to the west of the Sprain Brook, in Dobbs Ferry and Ardsley, and reserved sites to the east, in Hartsdale and White Plains, for the French. General Washington chose lower Westchester as the site of the allied encampment because he hoped, with the help of the French, to gain a major battlefield victory by driving the British army from Manhattan, which had been seized by Britain in 1776. It was a grim time for the 13 United States. The British and American sides were locked in military stalemate, and political prospects for the young republic were poor. The conviction was growing in Paris that the War for American Independence was unwinnable. The French government was hoping to extricate itself and end the war through a settlement determined by the Great European Powers at a conference in Vienna. It was understood that a Vienna settlement would impose highly unfavorable terms for the United States: The country’s independence would still be contested, and its territory truncated. Most likely the entire South and the trans-Allegheny West would be retained by Great Britain under the Vienna terms, and the so-called United States confined to a northeastern coastal strip. Moreover, the French would terminate their military support, and British armies would be poised to resume hostilities at any time that seemed favorable to them. Yet Congress, discouraged by the long, inconclusive war, instructed its representatives in Paris (John Adams and Benjamin Franklin) to accede to this plan. Washington understood the danger to his country, but he believed that a major victory on the battlefield could change everything. If the British were to suffer a significant military defeat, London might be willing to end the war on much more favorable grounds, making a conference in Vienna moot. In July the allied French and American armies probed for weakness in General Henry Clinton’s British forces on Manhattan, but they quickly learned that British defenses on Manhattan were formidable. By early August, Washington reluctantly had to conclude that there was little chance that the allied armies could defeat General Clinton’s troops. Admiral De Grasse informed the generals that he was bringing his large fleet from the West Indies to the Chesapeake Bay, and that he would be ready to cooperate with them in a joint land and sea campaign against General Cornwallis’s troops in Virginia. Upon considering De Grasse’s communication and after weighing his options, Washington abandoned his plan to attack the British in New York, and made the decision to risk a secret march of more than 400 miles, from the Hudson to Virginia. Urgent plans for the march were made from August 14th until August 19th. Washington risked all on this march. Success would require almost perfect coordination of several armies and fleets at great distances. Success would also require the utmost secrecy, for it was essential not to reveal to General Clinton in New York or General Cornwallis in Yorktown, Virginia, that Virginia was the destination of the allied armies. Follow this YouTube link for Pulitzer Prize winning historian, David Hackett Fischer’s comments about the decision that won the Revolutionary War.